Horizon Health Services » Blog Archive A Walk Towards a New Horizon 2018 | Save the Date! A Walk Towards a New Horizon 2018 | Save the Date! 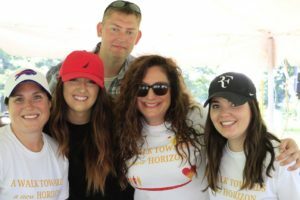 Horizon Health Services is preparing for its fifth annual Wellness Walk. The purpose of the walk is to gain funds for additional programs and education to better serve the needs of our community. Everyone is welcome! The 2018 Wellness Walk will take place on Saturday, September 15, 2018. Registration starts at 8:30 AM and the Walk begins at 10:00 AM. The entire event will be over around 11:30 AM. The Horizon Wellness Walk is held in Delaware Park on Ring Road. The start of the walk takes place near Colvin and Amherst Street. Registration is $30/person for everyone 12 and older which includes a Horizon baseball hat! Children under 12 are FREE and encouraged to participate! If they would like a Horizon baseball hat as well, it is an additional $15/hat. The Horizon Wellness Walk consists of only ONE lap around Delaware Park. Before the walk begins, there will be free food and refreshments available to all participants as well as a small raffle booth. Who can I bring to this event? The event is open to the public. You can bring your family, friends, and loved ones. Dogs are also welcome! Come out and meet some of our Horizon therapy dogs. Horizon Employees have received emails that contain the registration form. All others can register here. Yes! We have three levels of sponsorship’s available. Please visit our walk’s registration page for more information. What can I do after the event? The Delaware Park area has a lot to offer. Below are a couple of post-walk options close to our event. Especially to those individuals suffering from substance use or mental health disorders. The Health Management Group asks for your support to raise funds for additional programming and opportunities throughout Horizon. These funds will provide programs and education that specifically meet the unique needs of adolescents, young adults, families and adults struggling with mental health and/or substance use disorders. Our services offer people a new chance at living healthy and productive lives, and return them to their families, friends and communities. Your support is helping our mission: Together for Recovery. Changing Lives. Saving Lives. So, come out and join us for the Horizon Wellness Walk on September, 15th 2018! It’s a causal day and an easy way to support physical and mental wellness.